This goes without saying, but Thessaloniki is beautiful all year around. 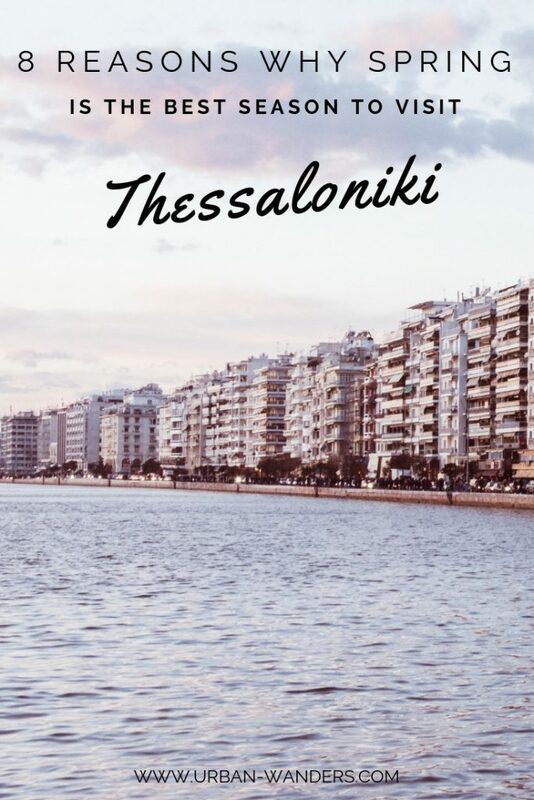 Nevertheless, there is something about the warm breeze, blooming flowers, and outdoor cafés and restaurants that make spring time the best season to visit Thessaloniki. 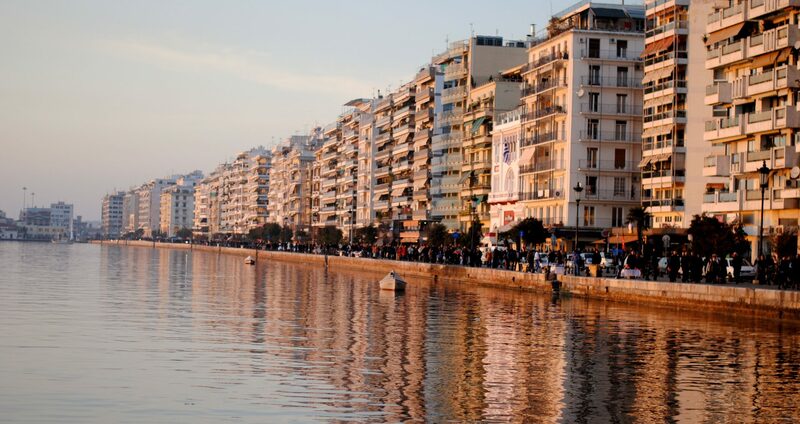 Keep on reading to find out why spring is the best season to visit Thessaloniki, Greece! Let’s face it; Greece is THE destination to visit during summer. But Thessaloniki? Not so much. Many locals leave the city to visit more “summer” destinations such as the Greek islands or Halkidiki. Granted the beaches are just a drive away, but to enjoy Thessaloniki you really need find that “just right” weather to wander around. For those long walks on the waterfront, the ideal season is one that is not too hot but not too cold either. Spring time in Thessaloniki offers the best weather all day long, from your morning coffee stroll to your late evening dinner in the city. We may not be the Netherlands, but the blooming flowers found throughout Thessaloniki truly will brighten up your day. 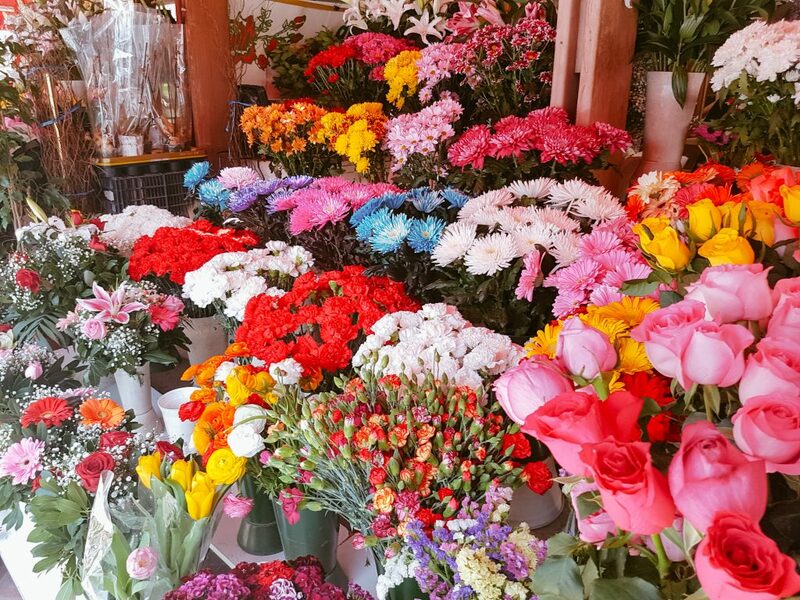 Be sure to wander through the “loulouladika”, or the flower market to find some of the brightest and most impressive flowers out there. This is also the only time of the year where you’ll see green vegetation and tall leafy trees. Because flowers are only seen during the spring months, their rare presence enhances the city’s charm. No matter what time of the year it is, Greeks love gathering with their friends for coffee. 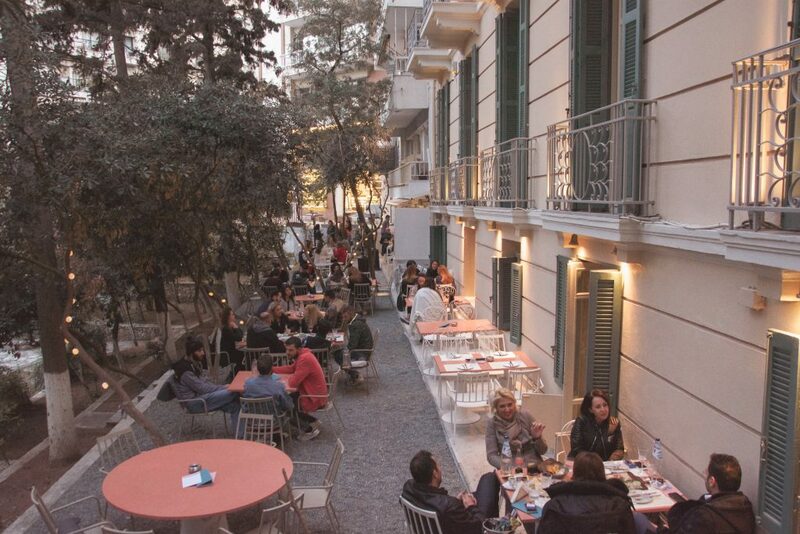 But once the weather clears up and spring comes around, Greeks flee towards the outdoor cafes to enjoy their social get-together. Enjoy your coffee with a view at one of the cafes outlooking the waterfront otherwise known as the “paralia.” The warm reflection of the sun against the water creates the ultimate soothing atmosphere to sip your iced coffee. Likewise, you can wander through the city and look for hidden gems like this secret cafe garden. Spring is the time to go to the beach! Those warm May and June afternoons call for road trips to the nearest beaches. Unless the temperate rises to 38 degrees Celsius (100 degrees Fahrenheit), it’s very unlikely to see any Greeks at the beach before summer hits. If you prefer having the whole beach to yourself, then now is the time to hit the beach! Another plus for going to the beach during the spring time is that you can avoid all the traffic jams that are inevitable during the summer. 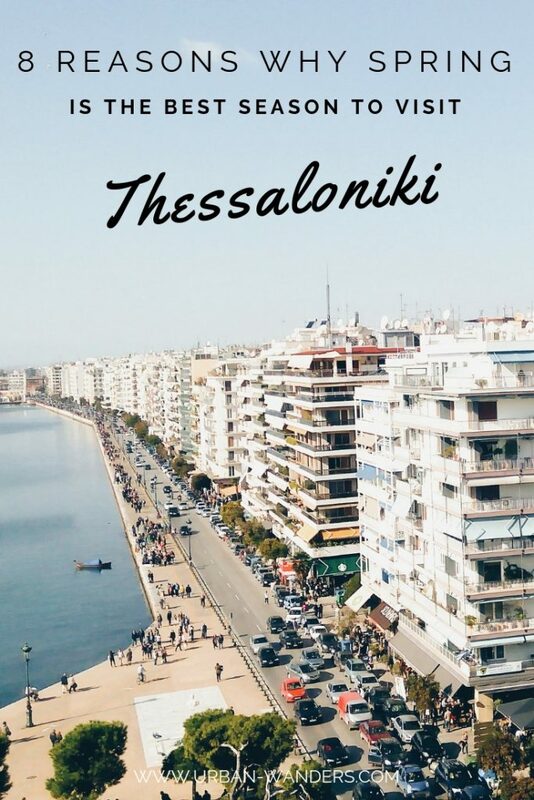 If you’re planning on visiting Greece and were wondering when to visit Thessaloniki, the spring time is definitely the time! My personal favorite reason why you should visit Thessaloniki, is that all the rooftop bars start opening up again. What’s more refreshing than drinking your cocktail while overlooking the whole city. Every year more and more rooftop bars pop up, leaving you with many options to choose from. From quiet and laid back rooftops to glamorous and chic bars – Thessaloniki has them all! 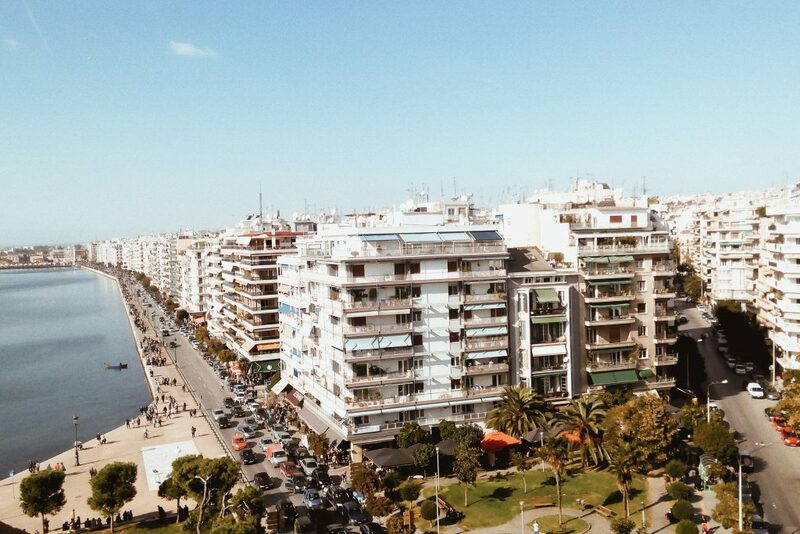 You can read about the top 5 rooftop bars in Thessaloniki here. There is something about grabbing a bite to eat and enjoying it outside when the weather is just right. Whether that is a mouthwatering gyro or a healthy falafel, springtime is the best season to sit outside and enjoy your food Every restaurant and tavern in the city will bring out tables for you and your family and friends to indulge in your meal in a warm and sunny environment. If street food is more your thing than you’ll want to read this. If you are traveling to Thessaloniki and would like a local to show you some hidden gems than this food & culture tour is just for you. Nothing feels more like spring, than outdoor concerts, dancing to music till the late hours. 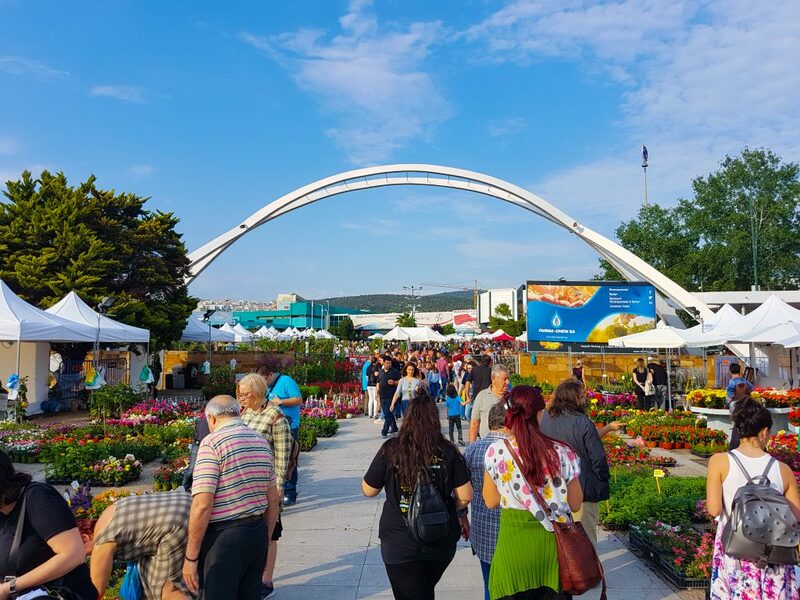 Thessaloniki makes no exception, hosting some of the biggest concerts, food festivals, fairs, flower exhibitions and more during the spring season. The weather is just right to stroll though the endless events happening in Thessaloniki during these spring months. For all those nature lovers out there, spring is the best season to go on all those day trips you were daydreaming about when the weather was too cold to even leave your house. Beautiful destinations such as Mt. Olympus, Kastoria, Edessa and more are just an hour or two drive away from Thessaloniki. If you are more of a city kid, fear not as spring is also the best time of the year to explore your own city. Head up to the Kastra (Upper City) with your friends, grab some beers and enjoy the city view, or stay in the city center and wander around the various district such as the Roman Forum neighborhood. I love spring travel, it’s always less busy and having been to Greece in June, it was already unbearably hot. Great point about the festivals too! I’ll have to go and check out Thessaloniki. Glad you enjoyed the post Natasha!